Michael Eugene Porter is an American academic known for his theories on economics, business strategy, and social causes. He is the Bishop William Lawrence University Professor at Harvard Business School. Michael Porter coined the term ‘Value Chain’ was first used in his book “Competitive Advantage: Creating and Sustaining Superior Performance” (1985). 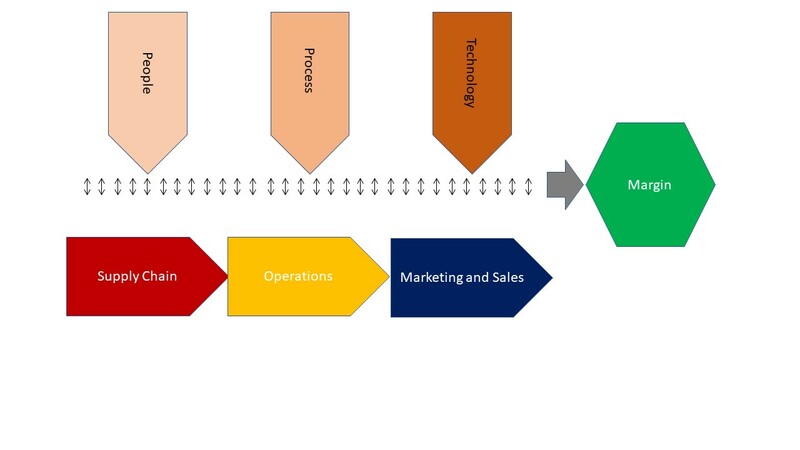 The value chain is a process of translating organisational activities and its performances to gain a competitive position in the market place. In any process, we find Core activities and Support activities that collectively deliver performance outcomes in the form of margins. Here margin refers to the profits earned for a product or service through sales revenue which is more than the sum of the cost of all activities in the value chain. Porter’s basic model as shown below identifies direct and indirect activities in any organisation which drives margins. Porter’s value chain emphasizes on the process of how inputs change the outputs purchased by consumers which delivers competitive advantage and targeted margins of the organisation. These activities support the core functions identified above. In the above diagram. For example, procurement supports operations with certain activities, but it also supports marketing and sales with other activities. 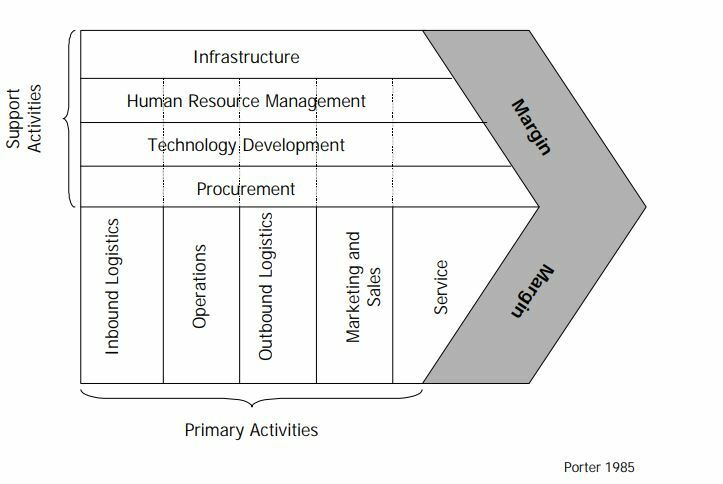 In my opinion, the fundamental difference between supply chain and value chain is the element of “margin” part of Porter’s value chain. Supply Chin never deals with margins, it deals with SMART Goals, KPIs, deliverables – Quantitative and qualitative. The supply chain cannot assure margins which largely depends upon sales and sales is outside the purview of supply chain and whereas Porter’s value chain the core activities include Marketing and sales which could drive improved margins with other elements such as inbound logistics, Operations and Service supporting the improved margins. My concept of the value chain bit different from Porter’s version. I firmly believe that People, Process and Technology is the support functions and the core functions are Supply Chain, Operations, Marketing and Sales and I firmly believe that customer service is part of Marketing and sales. If we integrate these functions and work towards organisational goal effectively we can achieve targeted margins. I am not critical about Porter’s view, but I am presenting my views as a Supply Chain professional. Today’s world is collaborative in nature. No function is superior and no function can attain organisational goals independently. It’s a team approach. In my theory, people, process and technology enable supply chain, operations and marketing and sales to achieve competitive advantage in the market place. 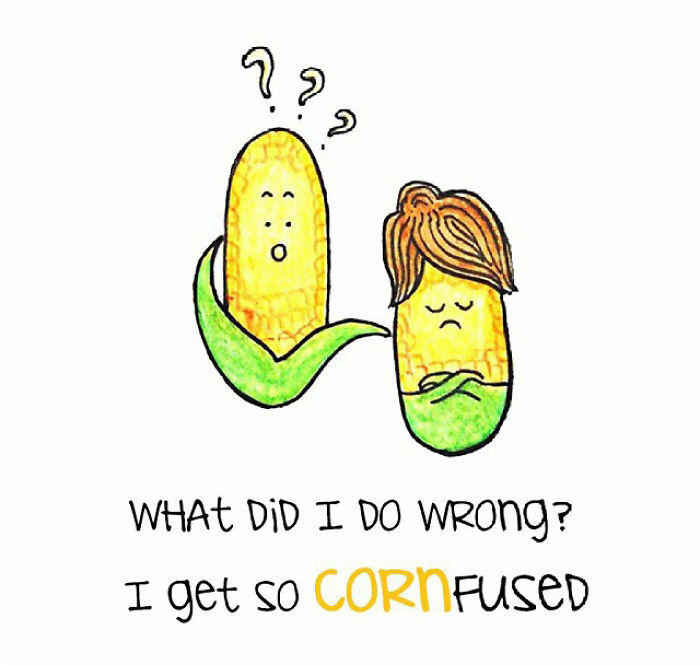 One more point is that the communication channel between support functions and core functions is two-way. Listen, Respond and React is the communication strategy for achieving targeted goals. I appreciate your views and comments.